The final release is due in February. Draft release notes here. You can pass in things like ‘next Wednesday at 4:20pm’ or ‘Saturday afternoon’ to process. Moving from deploying a Go app to a single machine up to an entire cluster, Kelsey Hightower shows us how to treat the world as one massive global-scale computer. 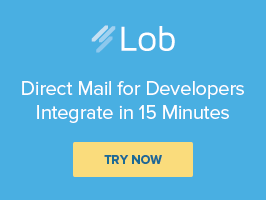 Lob provides an API that enables developers to send postcards, letters, checks, and more as effortlessly as sending emails. Lob is based in San Francisco, CA and is venture backed with over 6000 customers including Amazon, Square, and Counsyl. go-callvis is a tool to help visualize the call graph of your program that uses Graphviz’s dot format. Aims to wrap ‘all of the best packages available and make them all play nicely together’. Written in Go, naturally. It supports UTF-8 and numerous IRCv3.1 and IRCv3.2 extensions. A look at the new plugin package coming in Go 1.8 - a bit of background, a look on how to make use of it and some of its (current) limitations. From monolith to microservices, and all the impact around it. Join us building the ultimate online playground for kids of all ages. High-level sessions on leadership and culture plus lightning talks on new tech and programming languages. This tutorial explores using Go’s benchmarking tools to look over a naive concurrent version of MergeSort, and applying a simple fix. How to use materialized views to process large amounts of data fast on PostgreSQL? How about other DBs? This release adds support for the ESP8266 wireless microcontroller. Have linked before but well worth revisiting.